علی پور, محمد, اسلامی فارسانی, رضا. (1397). بررسی ریزساختار و سختی نانوکامپوزیت ریختگی آلومینیوم 7068 تقویت شده با نانوذرات SiC. علوم و فناوری کامپوزیت, 5(4), 461-468. محمد علی پور; رضا اسلامی فارسانی. "بررسی ریزساختار و سختی نانوکامپوزیت ریختگی آلومینیوم 7068 تقویت شده با نانوذرات SiC". علوم و فناوری کامپوزیت, 5, 4, 1397, 461-468. علی پور, محمد, اسلامی فارسانی, رضا. (1397). 'بررسی ریزساختار و سختی نانوکامپوزیت ریختگی آلومینیوم 7068 تقویت شده با نانوذرات SiC', علوم و فناوری کامپوزیت, 5(4), pp. 461-468. علی پور, محمد, اسلامی فارسانی, رضا. بررسی ریزساختار و سختی نانوکامپوزیت ریختگی آلومینیوم 7068 تقویت شده با نانوذرات SiC. علوم و فناوری کامپوزیت, 1397; 5(4): 461-468. 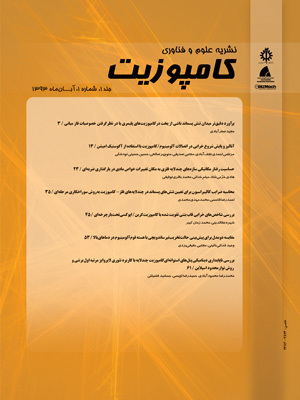 در این تحقیق، خواص مکانیکی و ریزساختار نانوکامپوزیت آلومینیوم 7068 تقویت شده با 1، 2، 3 و 5 درصد نانوذرات کاربید سیلسیم (SiC) تولید شده به روش ریخته گری گردابی با کمک حباب زائی مافوق صوت بررسی شد. جهت اختلاط مناسب آلیاژ و نانوذرات از دستگاه مافوق صوت مجهز به سیستم خنک کننده با توان 2000 وات استفاده شد. همچنین برای مطالعات ریزساختاری، میکروسکوپ الکترونی روبشی بکار گرفته شد. مطالعات ریزساختاری نانوکامپوزیت نشان داد که حضور نانوذرات SiC باعث کاهش اندازه دانه می شود. اما در درصدهای بالای نانوذرات SiC (5% وزنی)، کاهش محسوسی در اندازه دانه ایجاد نمی‌شود. همچنین حضور نانوذرات و کاهش اندازه دانه، افزایش چشمگیر سختی نانوکامپوزیت را به همراه دارد. البته در درصدهای بالای نانوذرات SiC (5% وزنی)، این ذرات در مرزدانه ها کلوخه ای شده و باعث کاهش سختی کامپوزیت می شوند. نانوکامپوزیت تقویت شده با 3% وزنی نانوذرات، سختی 155 برینل را نشان داد که بهینه ترین درصد نانوذرات SiC می باشد. با توجه به نتایج سختی نمونه اولیه و نانوکامپوزیت با 3 درصد وزنی SiC، 24 درصد افزایش سختی مشاهده می شود. In this study, microstructure and mechanical properties of AA7068 nanocomposite reinforced with 1, 2, 3 and 5 wt.% SiC nanoparticles (SiCnp) produced by stir casting and ultrasonic treatment have been investigated. Ultrasound device equipped with a cooling system with 2000 W powers was used for mixing alloy and nanoparticles. Also scanning electron microscopy was used for microstructure studies. The microstructure of nanocomposite was investigated by scanning electron microscope.The microstructural studies of the nanocomposite revealed that SiCnp addition reduces the grain size, but adding higher SiCnp content (5 wt.%) does not change the grain size considerably. Further investigations on hardness revealed that the addition of SiCnp increases hardness. At higher SiCnp contents (5 wt.%), the presence of SiCnp agglomerate on grain boundaries was found that causes decrease the hardness. The optimum amount of nanoparticles is 3 wt.% SiCnp that nanocomposite exhibits hardness of 155 BHN. According to the results of hardness for the initial samples and nanocomposites reinforced with 3 wt.% SiC, 24% increase in hardness can be seen. Abbasi, HY. Habib, A. Tanveer, M., "Synthesis and Characterization of Nanostructures of ZnO and ZnO/Graphene Composites for the Application in Hybrid Solar" Journal of Alloys and Compounds, Vol. 690, pp. 21–26, 2017. Li, X. Yang, Y. Chen, X., "Ultrasonic-Assisted Fabrication of Metal Matrix Nanocomposites" Journal of Materials Science, Vol. 39, pp. 3211-3212, 2004. Yibin, X. Yoshita, T., "Thermal Conductivity of SiC Fine Particles Reinforced Al Alloy Matrix Composite with Dispersed Particle Size" Journal of Applied Physics, Vol. 95, pp. 722-726, 2004. Borgonovo, C. Apelian D., "Manufacture of Aluminum Nanocomposites: A Critical Review" Materials Science Forum, Vol. 678, pp. 1-22, 2011. Karbalaei Akbari, M. Shirvanimoghaddam, K. Hai, Z. Zhuiykov, S. Khayyam, H., "Al-TiB2 Micro/Nanocomposites: Particle Capture Investigations, Strengthening Mechanisms and Mathematical Modelling of Mechanical Properties" Materials Science and Engineering: A, Vol. 682, pp. 98–106, 2017. Miracle, D., "Metal Matrix Composites–from Science to Technological Significance" Composites Science and Technology, Vol. 65, pp. 2526-2540, 2005. Wenzhen, L. Shiying, L. Qiongyuan, Z. Xue, Z., "Ultrasonic-Assisted Fabrication of SiC Nanoparticles Reinforced Aluminum Matrix Composites" Materials Science Forum, Vol. 654-656, pp. 990-993, 2010. Hihn, JY. Doche, ML. Mandroyan, A. Hallez, L. and Pollet, BG., "Respective Contribution of Cavitation and Convective Flow to Local Stirring in Sonoreactors" Ultrasonics Sonochemistry, Vol. 18, pp. 881-887, 2011. Amirkhanlou, S. Ji, S. Zhang, Y. Watson, D. Fan, Z., "High Modulus Alsingle BondSisingle BondMgsingle BondCu/Mg2Sisingle BondTiB2 Hybrid Nanocomposite: Microstructural Characteristics and Micromechanics-Based Analysis" Journal of Alloys and Compounds, Vol. 694, pp. 313–324, 2017. Yan, J. Xu, Z. Shi, L. Ma, X. Yang, S., "Ultrasonic Assisted Fabrication of Particle Reinforced Bonds Joining Aluminum Metal Matrix Composites" Mater & Design, Vol. 32, pp. 343-347, 2011. Shabana, S. Sonawane, SH. Ranganathan, V. Pujjalwar, PH. Pinjari, DV. Bhanvase, BA. Gogate, PR. Ashokkumare, M., "Improved Synthesis of Aluminium Nanoparticles Using Ultrasound Assisted Approach and Subsequent Dispersion Studies in di-octyl Adipate" Ultrasonics Sonochemistry, Vol. 36, pp. 59–69, 2017.